Canada - YTV will premiere Knight Squad, Nickelodeon’s newest live action comedy series, set at a magical school for knights in training, where two mismatched students form an unlikely alliance to protect each other’s secret and pursue their dreams, on Friday 16th March 2018 at 7:00pm ET/PT! 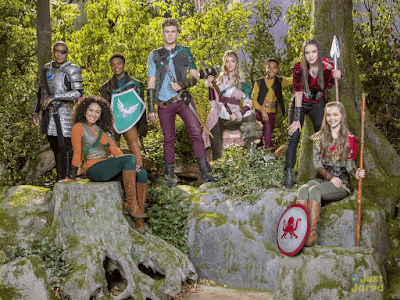 Knight Squad stars Owen Joyner (100 Things To Do Before High School) as "Arc," Daniella Perkins (Legendary Dudas, Blurt) as "Ciara," Amarr M. Wooten (American Housewife) as "Warwick," Lexi DiBenedetto (Modern Family) as "Prudence," Lilimar (Bella and the Bulldogs) as "Sage", Kelly Perine (Santa Hunters) as "Sir Gareth"; and Seth Carr as "Fizzwick". Tenzing Norgay Trainor will also guest star on the show as a character named "Jimbo". Lizzy Greene from Nickelodeon's Nicky, Ricky, Dicky & Dawn will also guest star in an episode during season one. Knight Squad made its world premiere on Nickelodeon USA in February 2018, and will be rolling out on Nickelodeon channels and programming blocks globally throughout the year. More YTV: YTV To Debut 'Mysticons' Season 2 On Sunday 8th April 2018! Follow NickALive! on Twitter, Tumblr, Google+, via RSS, on Instagram, and/or Facebook for the latest Nickelodeon Canada and Knight Squad News and Highlights!